IBM® Spectrum Virtualize is a key member of the IBM Spectrum™ Storage portfolio. It is a highly flexible storage solution that enables rapid deployment of block storage services for new and traditional workloads, on-premises, off-premises and in a combination of both. IBM Spectrum Virtualize™ for Public Cloud is a brand new offering that provides the IBM Spectrum Virtualize functionality in IBM Cloud. This new capability provides a monthly license to deploy and use Spectrum Virtualize in IBM Cloud to enable hybrid cloud solutions, offering the ability to transfer data between on-premises private clouds or data centers and the public cloud. 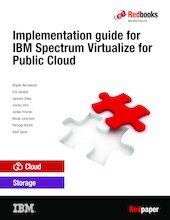 This IBM Redpaper™ publication gives a broad understanding of IBM Spectrum Virtualize for Public Cloud architecture and provides planning and implementation details of the common use cases for this new product. This publication helps storage and networking administrators plan and implement install, tailor, and configure IBM Spectrum Virtualize for Public Cloud offering. It also provides a detailed description of troubleshooting tips.